Keeping out invasive and troublesome nasties needn’t be an expensive affair. In fact, it doesn’t have to cost anything at all. Many of the best performing system security packages currently available are completely free for personal use. Some are even gratis for business use too. Here are a few Windows-based security essentials to help keep your system safe and sound. Readers using Mac or Linux systems in need of suggestions are encouraged to request information via the comments and I’ll get back to you. Although often thought to be less prone to attack, threats to non-Windows operating systems do exist and are on the rise so such systems should still be protected from outside troublemakers. Crawler’s Spyware Terminator is free for both business and home use and unlike many of its free counterparts, provides realtime protection as well as system scanning. Clam AV can be optionally integrated into the program at installation, after which the Realtime Shield quietly monitors your system until it discovers something untoward and springs into action. Users can set the level of automation and choose how deep system scans need to go. Engine and database updates are free, as is the technical support although self help via forums and faq’s is encouraged. Really easy to use and as flexible as you need it to be. Regularly scanning your PC with a-Squared free edition from Emsisoft should keep it as clean as a whistle. The program consistently scores highly in independent detection tests, is easy to use and updates daily to ensure you benefit from the most up to date detection database. The free version of AVG is a stripped down version of the company’s paid-for suites and contains the anti-virus and anti-spyware engines. At every turn you’re encouraged to buy the enhanced protection offered by the paid-for versions but the free version provides adequate protection for most users. Engine and database updates are also free. Avast Free is another trusted anti-virus program, recently improved with a much slicker and easier to use interface. Registration is required to use Avast Free, which needs to be renewed annually but it’s well worth the effort. New and experienced users alike will find the program powerful and simple to use. I have used Comodo Firewall for a number of years and am very impressed. Comodo has now combined its firewall, malware guard and anti-virus programs into one handy suite. Getting the best from Comodo does require putting in some effort but if water-tight protection is what you want then this program provides the best free firewall around and is well worth the effort. Another combined suite to include a firewall is FortiClient EndPoint Security Suite and you get an awful lot for nothing, including anti-virus and anti-spyware engines, personal firewall, anti-rootkit protection, anti-spam protection and behavioral analysis. Mailwasher is a powerful spam filtering program that allows you to monitor your emails at the actual mail server and only load approved emails into your client. The program will even send bounceback “user does not exist” emails to those you choose to blacklist. The free version is limited to just one email address though which is geared towards encouraging you to upgrade to the Pro version and part with some cash. An otherwise excellent spam-fighting tool. 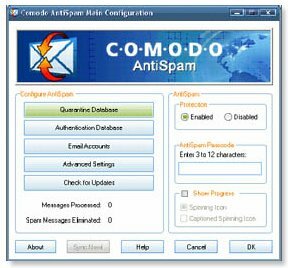 Comodo Anti-Spam looks to authenticate the sender of each email you receive. Like the internet security suite, user participation is required but ultimately worth it. Every computer that’s been in use for a while accumulates unnecessary clutter in the shape of temporary files that hang around for no reason, orphaned system files, browser history, out of date or unused programs or file shortcuts and so on. Piriform’s CCleaner can help safely clear out an awful lot of that unwanted junk at the click of a button. It’s worth pointing out that having more than one program performing the same system security tasks on a computer is probably asking for trouble. For conflict-free protection, make sure you install only one anti-virus program, one anti-spyware program, one firewall and one anti-spam filter. If you opt to install a suite of applications then remember to uninstall or disable anything that may conflict with the new program. Do you have a freely available system security tool or suite to recommend?